In a post-apocalyptic world where The Struggle was meant to save the lives of The People, memories have been outlawed. The Thief barely makes a living by stealing the scenes and lives from the elderly; selling them to junkies that get off experiencing life through the minds’ eye of the past. Now, children play on the rubble of buildings and statues, rather than in grassy fields and parks, under the burning red skies of a world destroyed by war and terror. The Thief goes on believing that his family was killed in one of the riots that led up to The Wars, when he stumbles on a memory that suggests otherwise, and that the people he works for may be responsible for their disappearance. Korpon’s debut novel, Stay Go_d, and his follow-up novella, Old Ghosts, have made it obvious that the author intends on leaving a mark in the dark and gritty Noir genre. And he does so painfully, with a voice and story that leave you aching for more with every piece of work, generally with a final twist that could open the plot for another full length leg of story, resulting in pages upon chapters of words that bleed, grow arms, and drag you joyfully into worlds of violence and horror. But it is these twists that have closed his stories, conclusive chapters in the lives of his protagonists, spelling out that their lives go on, and somehow are unbelievably about to get way way worse. 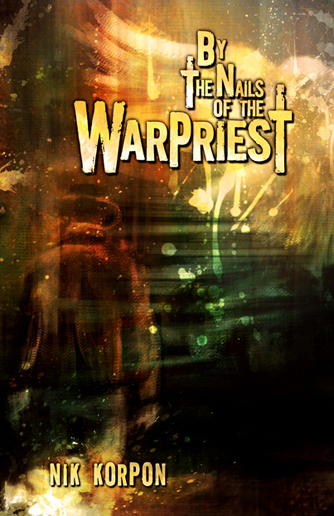 By the Nails of the Warpriest differs very little, in that the writing is stronger than the last, cutting through reality, prying it apart and sucking you and everything around you into Korpon’s new world. You follow The Thief through the streets, dodging the toxic rain and seedy population, getting splashed and sprayed with the blood of life’s victims. You smell the rotting stink as Earth and everything on it destroys itself in one last suicidal gasp. You bare witness to a future so vivid that if it doesn’t become true, it will rock you to the core far more than the truth about Santa, The Tooth Fairy, Easter Bunny, Weapons of Mass Destruction, Jesus, and The Moon Landing ever have, combined. And although the ending is the most conclusive, it isn’t not as strong as Korpon’s previous works by a long shot. It is an ending that not only makes sense, but could be the only possible ending of them all. With that being said, there is still that sense that you the reader needs more when the story ends. You turn from the final page, set the story down and realize that you’re still at home, or looking at the clock while it ticks the final seconds of your lunch break. You’re back to your life, and although it is more than likely safer, it is most definitely less interesting, and lacks in the rich language and excitement that the world of By the Nails of the Warpriest provides in its very short thirty-nine pages. This entry was posted in Reviews and tagged By the Nails of the Warpriest, Nik Korpon, Old Ghosts, Outsider Writer's Collective, Stay Go_d. Bookmark the permalink.